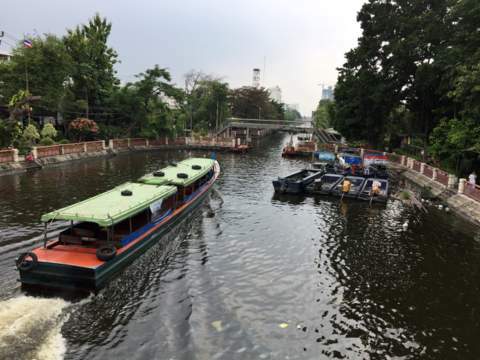 The Phasi Charoen Canal boat provides a boat service to serve residents in their daily lives and gives visitors a chance to take a canal tour to see life by one of the many canals in western Bangkok. It’s a free service at the moment and even if we had to pay, it’s still worth the ride. 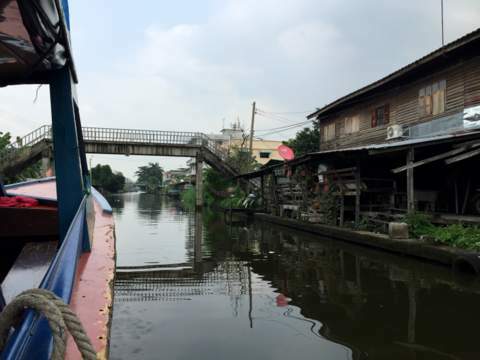 The canal boat trip takes visitors through a very old part of Bangkok where life is very different from the urbanised city centres. 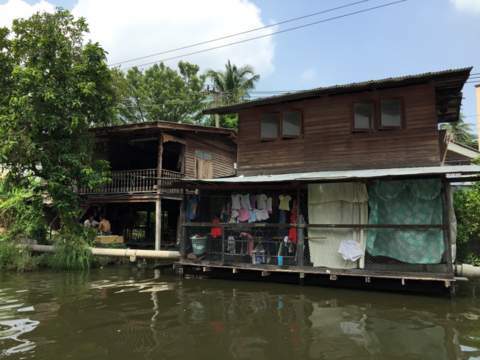 See a side of Bangkok that you don’t usually get to see from the roads. 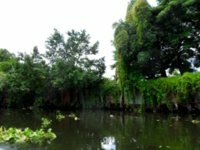 The Phasi Charoen Canal runs from the Bangkok Yai Canal near Wat Pak Nam, passes through three districts in Bangkok; Phasi Charoen, Bang Khae, Nong Khaem before joining the Tha Chin River in Samut Sakhon province, a distance of 27 km. 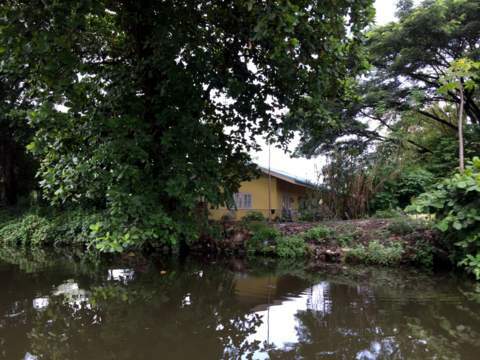 In the reign of King IV (1851 – 1868), an opium tax collector Phra Phasi Sombat Boribun was tasked to dig this canal. Proceeds from the opium tax were used to pay the Chinese labourers employed for this task. 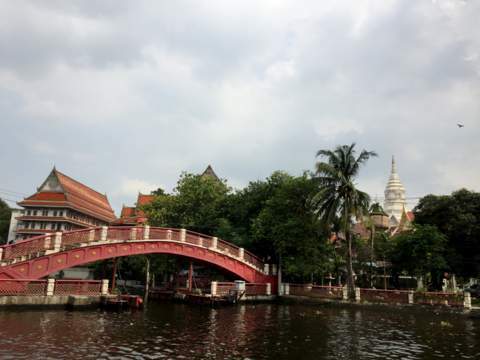 The canal was completed in 1872 in the reign of King Rama V (1868 – 1910). 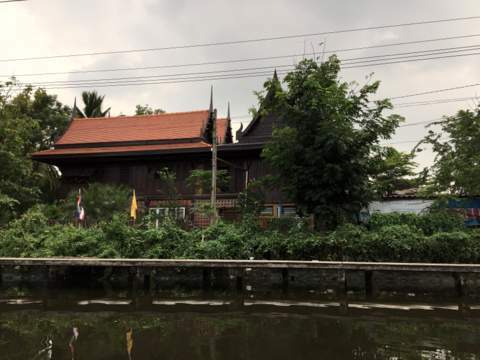 Appropriately, the newly dug canal was named Phasi Charoen (phasi – tax, charoen – prosperity), a fitting play of words given that the person in charge of the project was named Phra Phasi Sombat Boribun and made his money from tax on the thriving opium trade. 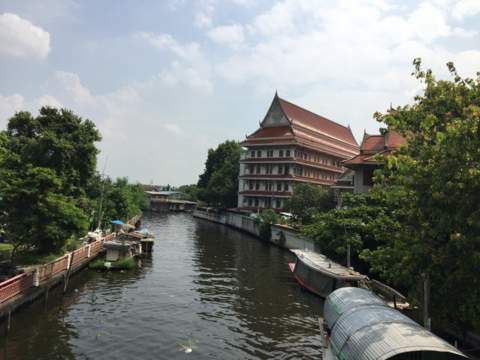 Like the Mahasawat Canal, the Phasi Charoen Canal is one of the canals in Bangkok linking the city to the neighbouring provinces. 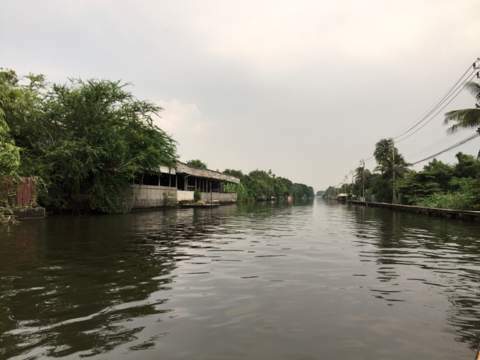 The west bank of the Chao Phraya still has a vast network of canals today unlike the city centre on the east bank where many canals have been covered up for road expansion. 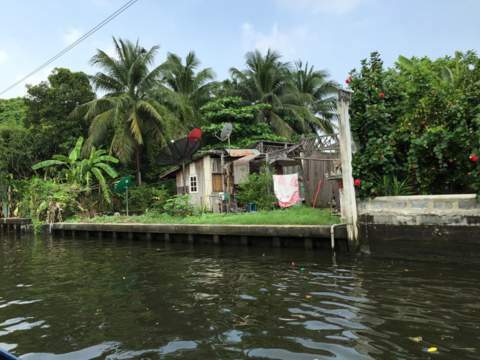 The Phasi Charoen Canal passes through the more rural areas of Bangkok and visitors can still view the peaceful way of life by the canal. 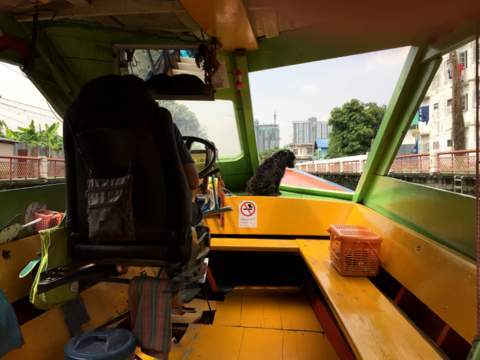 The Phasi Charoen Canal boat service was a pilot project started in early 2014 to provide commuters with a free boat service as an alternative transport link to ease the traffic congestion on the roads. The project was originally intended to last only for seven months. It must have been a success as the service is still running in late 2015. 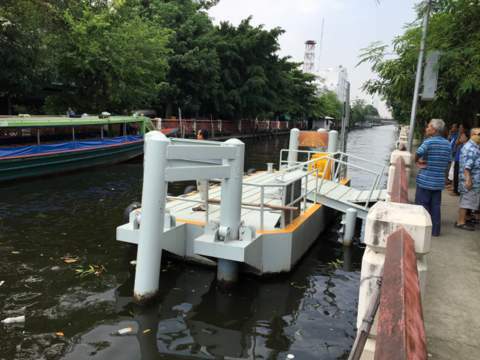 The canal boat service connects the Pratunam Phasi Charoen (Phasi Charoen sluice gate) Pier near area where the canal joins the Bangkok Yai Canal to the Phetkasem Soi 69 Pier in Bang Khae district, a distance of about 11 km. 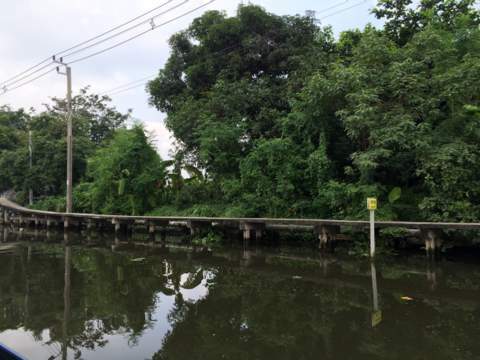 This canal boat service connects commuters to Bang Wa skytrain terminal station on the Silom line. 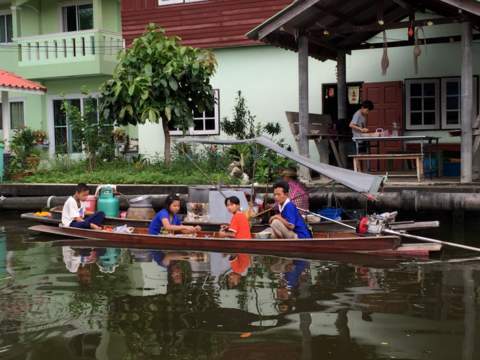 Furthermore it provides a useful transport service to the residents living along the Phasi Charoen Canal. A trip from the Pratunam Phasi Charoen Pier to the Phetchakasem Pier takes about 50 minutes. The Phasi Charoen Canal boats are scheduled to arrive at the piers according to the following timings. Please note that there is no boat service from 0900 – 1600 hours on weekdays. For visitors who wish to take a boat tour of the canal, the weekends are the most suitable. During our canal boat trip along the entire route and back, we noticed that the boat operators maintained very strict speed limits especially when they were passing waterside communities in order to minimise the backwash. There is an official at each pier to help berth the canal boat and help passengers alight. This person is in addition to the boat assistant on board. Life jackets are conveniently placed in racks above the seats. 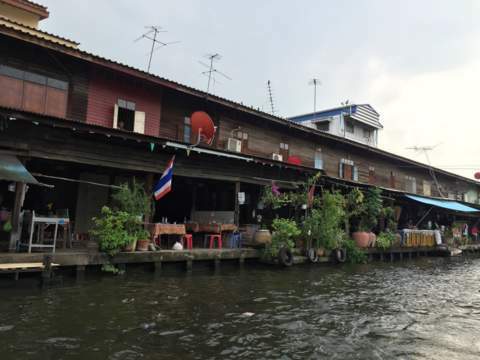 The biggest advantage of the Phasi Charoen Canal boat service is the connection to the mass rapid transport services on the west bank of the Chao Phraya River. Currently P4 Taksin Bridge-Petchakasem Pier is about 200 m from the Bang Wa skytrain station terminal station on the Silom line (in green). There’s a plan to link these two places with a skywalk for the convenience of commuters. 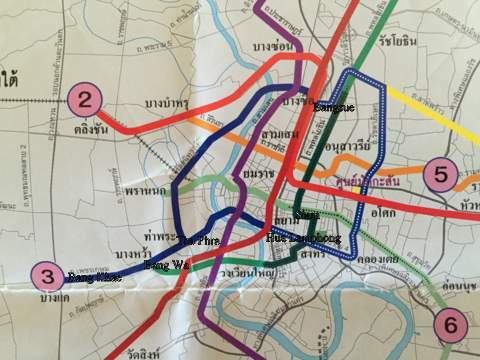 The Blue Line will eventually link to other mass rapid transit lines in other parts of Bangkok to provide an integrated network for fast and convenient travel. 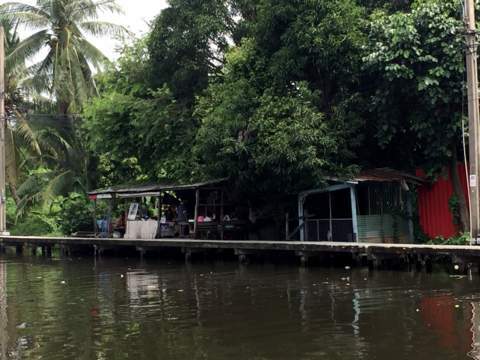 The Phasi Charoen Canal boat service primarily serves as a public transport service for commuters to get to and from work. However during the weekends, it’s a convenient means for a pleasant weekend outing with family and friends to see the old way of life and the impending changes along the canal. 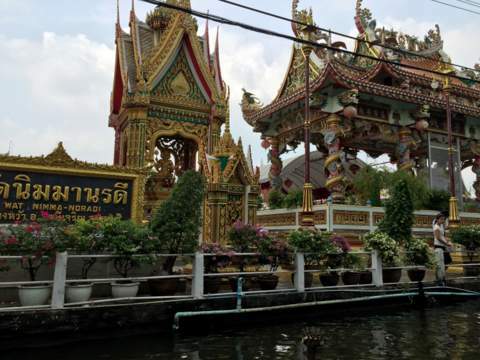 Let’s take a Phasi Charoen Canal boat ride to view some of the attractions and scenes along this canal boat service route. Here are some of the attractions at some of the piers along the way. You can choose to alight and visit these places or remain on board, take a boat tour of the entire route and enjoy the scenery. We passed old communities along the canal banks with their old houses, little shops and an old market. It’s a peaceful life along the canal and on Sunday fishing in the canal is a popular past time. Narrow tracks run along the canal banks for pedestrians and motorcycles and arched bridges at regular intervals span the canal providing crossings for residents. 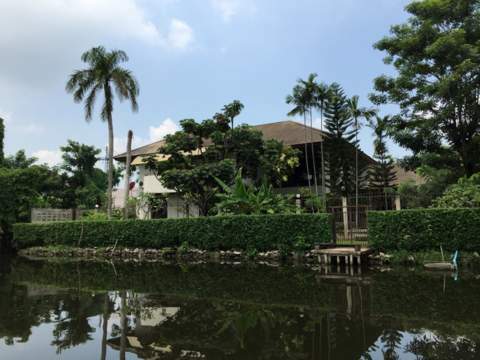 With temples, schools and small shops near the banks and even a modern mall, residents can live along the banks of the canals as a self-contained community without having to move out to the main road. Condominiums, modern houses and grand mansions are located on the same banks as traditional wooden houses, a quaint blend of the old and new. The occasional boat vendor can still be seen and we passed a family on a boat outing stopping by a boat vendor. With the completion of the Blue Line passing along Phetkasem Road more and more condominiums will be sprouting up in the area. 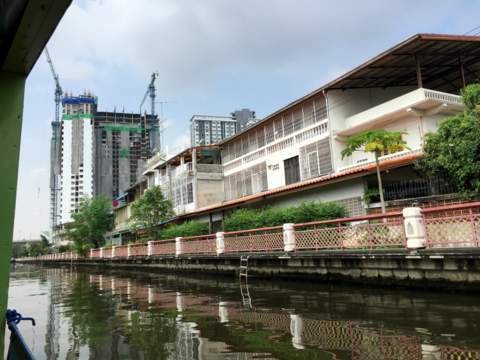 The extension of the Silom line across the Chao Phraya to Bang Wa has already resulted in huge condominium projects along the line. We hope that the old can continue to co-exist with the new as it would be a shame if old communities who have lived here for a few generations disappear in the course of development. 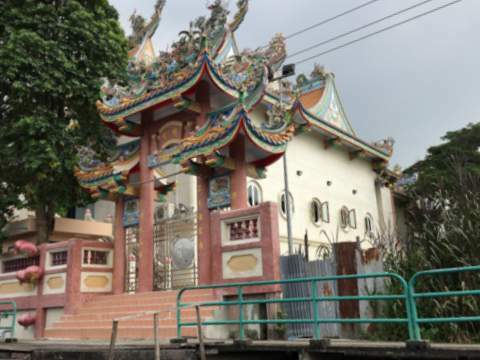 There are some beautiful temples along the way and a Chinese shrine as well, the Jao Mae Thub Tim Shrine dedicated to a goddess. 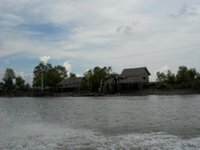 Piers are located at these temples where you can alight for sightseeing and board another boat later. Note that the boats arrive an hour apart during the weekends. At P15 Phetchakasem 69 Pier, the terminal pier in Bang Khae, there’s a market Khlong Kwang Market where visitors can enjoy some of the local food, coffee and stretch their legs. Wash rooms are available in market building. If you are travelling during the weekends, the boats leave every hour on the hour so be sure to be back a few minutes before. On the return trip, make sure you sit on the same side of the boat as your forward trip. This will give you a closer view of the other bank for your photographs and let you catch some of the views you might have missed earlier. 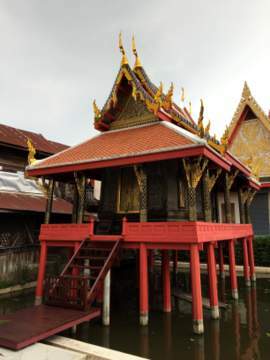 On your return to Paknam Phasi Charoen, visit the three temples in the vicinity; weave through narrow lanes past old communities to view these beautiful structures in Wat Paknam Phasi Charoen, Wat Khun Chan and Wat Upsorn Sawan. 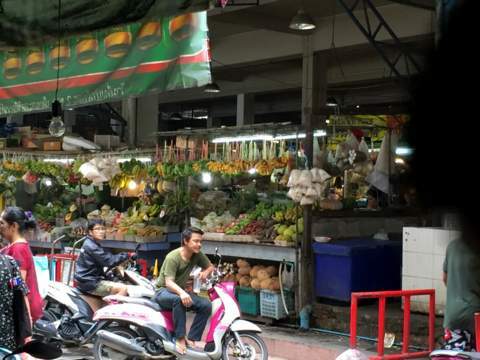 Still hungry, then grab a quick meal at the Charoen Si Market nearby. The pad thai (fried glass noodles and hoi tod (mussels fried in batter) are mouth-watering. 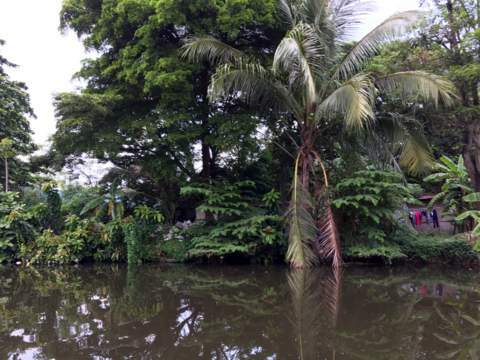 That brings us to the end of our Phasi Charoen Canal boat ride. Try it out yourselves one of these weekends. Please note that in the Google map, Petchakasem is spelt as Phet Kasem. 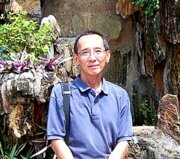 In this article we are following the spelling used in the Bangkok city signboards at the piers. 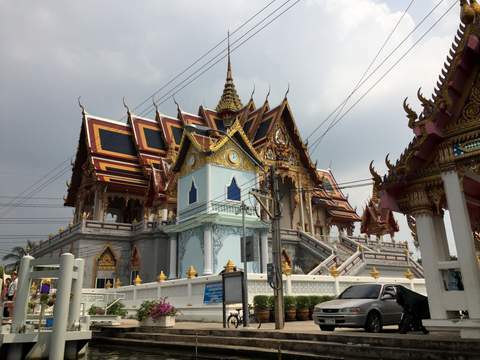 Cross the Chao Phraya River at the Taksin Bridge – Krung Thon Road – Ratchapruek Road – turn right into Ratchadaphisek Road – after crossing the railway line turn left to Thoet Thai Road – turn right to Ratcha Mongkon Phasan Road. Cross over at the Krung Thep Bridge – go straight onto Ratchadaphisek Road and follow directions as above. There a multi-storey carpark in the grounds of Wat Paknam with electronic barriers and time cards. Parking fees are free for the first hour and 20 baht per hour for subsequent hours. Take a BRT (Bus Rapid Transit) from Sathorn station which is linked to the Chong Nonsi skytrain station interchange and alight at the Ratchapruek BRT terminal station. 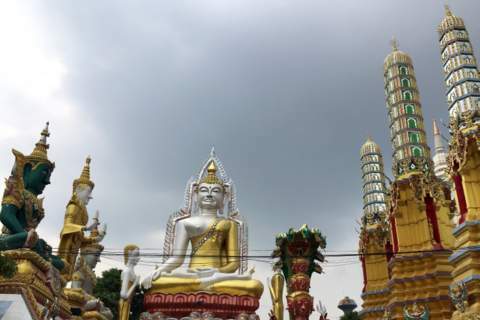 From there take a taxi or motor-cycle to Wat Pak Nam. 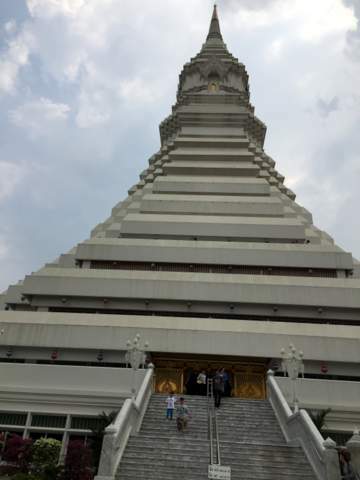 Alternatively, take the Silom line to the Talat Phlu skytrain station and from there take a taxi to Wat Pak Nam.